Dr Kayode Fayemi, the new governor of Ekiti state has addressed the people, telling them ‘today marks the end of an error’. 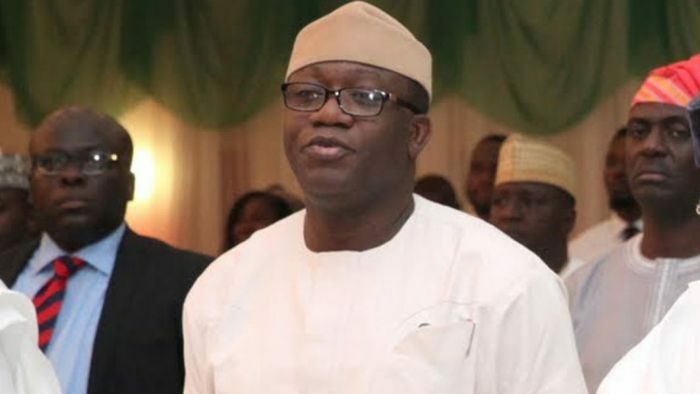 According to a TheCable report, Kayode Fayemi, governor of Ekiti, says his second term in office is to heal the wounds of the people. Fayemi was sworn in on Tuesday at the Olukayode Fayemi Stadium in Ado-Ekiti, the state capital. He said the arrival of his government marks the end of the past administration which he described as an “error”. Fayemi takes over the leadership of Ekiti from Ayodele Fayose who was absent at the inauguration ceremony. “As much as today marks the beginning of a new phase in our history as a people, it also signals the end of an era, or more appropriately, the end of an error. Without a doubt, Ekiti has been through a terrible wilderness experience within the last four years,” he said. “Our reputation as a people has been soiled and we have become the pot of jokes due to the ineptitude, loquacious ignorance and ravenous corruption masquerading as governance in our state during the last administration. “As we resume office, it is our duty, and we ensure to live up to it, to thoroughly review documents and widely disseminate the present state of affairs so that all and sundry know what has become of our commonwealth. “We will ensure that within 100 days from Today, Ekiti-kete will know the true position of things in keeping with our ethos of transparency and accountability in government. The governor highlighted a four-point agenda with which he said his administration will steer the economy of the state into progress. He listed the focus of his administration to include, “agriculture and rural development, social development, infrastructure and industrial development and entrenching the knowledge economy”. “The governance agenda of this administration is therefore compelled to focus on four key areas through which we will deliver our promises to the people,” he said. “The four pillars of our administration will be agriculture and rural development, social development, infrastructure and industrial development and entrenching the knowledge economy. “Our greatest resource remains our people. We, therefore, remain committed to rescuing the social safety nets that will bring succour to the most vulnerable segments of our society.